L=164mm/W=125mm/H=190mm. Nutritional Oil Canisters 3 litre made of tinplate, inside food-safe gold lacquered and outside black matt lacquered. Perfectly suitable for storing and selling cooking oil. Inclusive spout closures with tamper-evident seal. Our Nutritional Oil Canisters are especially designed for cooking oil and therefore the perfect packaging for edible oils. The bottles offer an elegant packaging solution for your high-quality olive oil, rapeseed oil, pumpkin seed oil and much more. 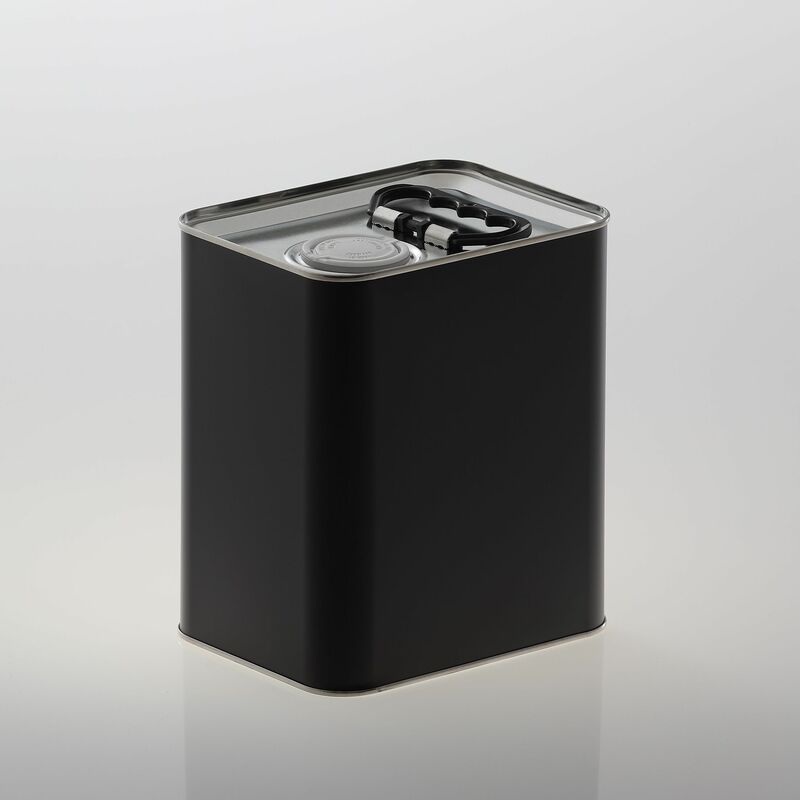 The Nutritional Oil Canisters are inside food-safe gold lacquered and outside black matt lacquered. The Nutritional Oil Canisters are perfectly suitable for food. Our oil canisters are impervious to light and air-impermeable. The canisters are stackable and through their rectangular shape space-saving during storage and transport. The Canisters are delivered with extricable black/white 42 mm pull-out spout closures with tamper-evident seal. Please select the desired colors when ordering! 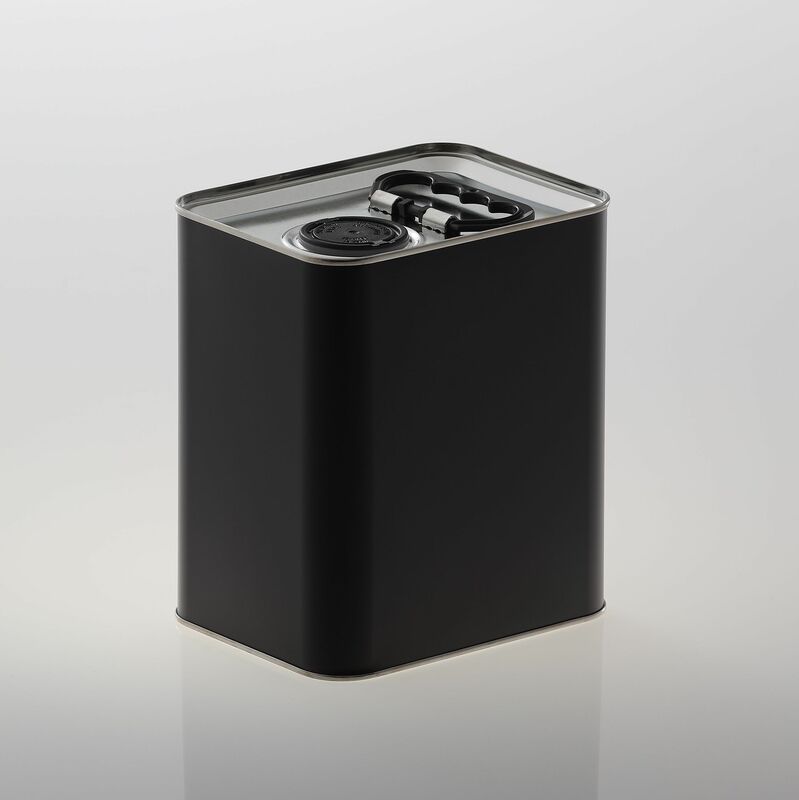 Canister with black, foldable carrying handle made of plastic on the top side. The spout closures will be pushed in after filling, either by hand or machine. After pressing in the spout closures our Canisters ensure optimal residual emptying and reclosability through the screwtop on the closure. All Canisters are made of tinplate (tinned sheet steel). Canisters made of tinplate without an appropriate inside coating are not suitable for water-containing filling goods or moist storage/handling. Contact with water or moisture can lead to rust. Due to the gold lacquering and protective coating of the seam on the inside of this canister certain residual moisture or a very low water content of the filling good is possible.